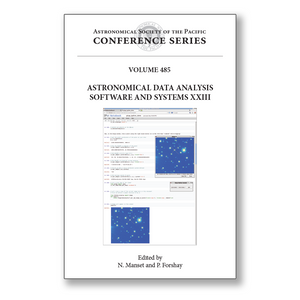 Editor(s): Manset, N.; Forshay, P.
This volume of the ASP Conference Series contains papers presented at the twenty-third annual conference for Astronomical Data Analysis Software and Systems, also known as ADASS XXIII. The ADASS Conference Series provides a forum for scientists and programmers concerned with algorithms, software, and software systems employed in the acquisition, reduction, analysis, dissemination, and storage of astronomical data. An important element of the program is to foster communication between developers and users with a range of expertise in the production and use of software and systems. The topics presented included software and languages, user interfaces, and emerging technologies for ground-based and space-based observatories from operations to archives. The conference included 13 invited speakers, 35 other oral contributions, five focus demonstrations and two “Birds of a feather” sessions. During the conference, over 100 posters and seven demonstration booths were available for viewing. These proceedings will be of interest to scientists and programmers involved with observatory operations from instrument design to data mining of archived observations.